Sawyer – Pickett Funeral & Cremation Service is located at 115 South State Street across from the former Pickett Funeral Home Building. The funeral home has just been renovated and really looks beautiful. Our spacious chapel will accommodate even the largest of families. It has two large lounge areas for food, drinks and children to play. There are also two family visitation areas with their own restroom and lounge facilities. 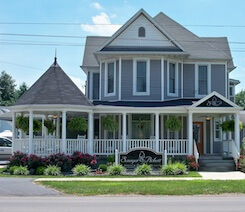 We are very pleased with our new front porch and feels that it adds character and beauty to the front of the building. We are now completely handicapped accessible and have a large parking lot located adjacent to the building. Arrangements have also been made with Dr. Trevor Miller of Miller Chiropractic Clinic to continue using the parking lot of the former Pickett Funeral Home after his business hours. By combining the two funeral homes into one convenient larger location, Brian, Harold and staff believe they can reduce expenses and better serve their customers with all of their funeral and cremation needs. Families will be able to enjoy the benefits of new renovation along with the charm that Jennings County's historical homes accentuate. Anyone who would like to stop by to visit Mr. Sawyer or Mr. Pickett and look at the work that has been completed is welcome anytime. No appointment will be needed.